UJJAIN: A newspaper published an adveritsement thanking police officials for letting bookies operate without any hinderance. 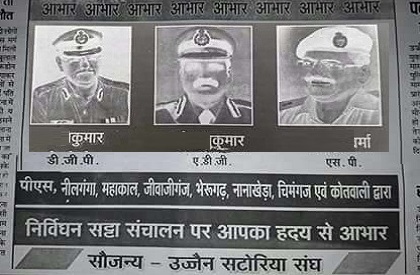 The advertisement that was published on behalf of 'Ujjain Satoriya Sangh' or 'Ujjain Bookies' Association' was printed in a Hindi paper, Shabd Sarovar. The photographs of top police officers including DGP, IG and SP were also published. The advertisement was published in the May 2 issue of the newspaper. It carried the line 'Aabhar, aabhaar...' (thanks, thanks...) at the top and lauded officers for letting bookies operate the 'Satta' (betting racket). The Satoria Sangh's message was that it thanked the officers from the bottom of heart. At first glance, it appeared to be a satire. However, the police have now registered a case against the newspaper. Police sources said that it was a malicious advertimsent which defamed the police officials. The publisher Ghanshyam Patel and the executive editor Abhay Kumar have been booked for defamation. "Who is behind the Satoria Sangh? Prima facie, it appears to be a mischief", said police sources, Also, no one had booked the advertisement, said sources, suggesting that it was published by the paper on its own. Hence, the police decided to register the case.